In a sauté pan add olive oil and heat, but not to the point of smoking. Season the chicken breast and dredge the chicken breast in flour. Begin searing your chicken breast usually 2-minutes each side till it has a nice golden sear. Remove the chicken breast add to the pan one cube of the butter and mushrooms. Sauté the mushrooms with garlic and shallots then deglaze your pan with the Marsala. Begin reducing the Marsala until it’s a little thick (add demi-Glace at this time if desired) and add the remaining butter slowly incorporating it to the sauce. Re-introduce the chicken breast to reheat. Make sure your chicken is cooked thoroughly. If the pan goes a little dry when reheating your chicken add a little water or stock to the sauce to bring it back to life. 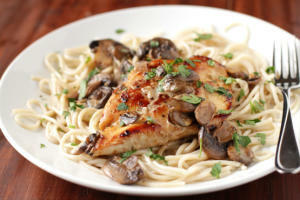 Heat your capellini and top it with your chicken and mushroom sauce sprinkle with chopped parsley. Bon appetit !!! !